Everything we do revolves around providing exceptional dentistry to our patients. 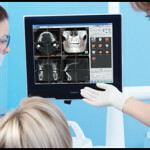 Now, with PreXion 3D imaging, our patients can actually see the bone structure of their mouths. This technology allows us to determine the exact position and condition of each tooth, root structure, and the jaw – in 3D! The image can be rotated, circled, and viewed from within and without. What was once science fiction is now a tool we use to map the precise route to restoration or surgical repair. your dentist with the ability to see any area of your dental anatomy from any angle. allow us to safely diagnose and customize your treatment like never before. PreXion3D combines the highest quality 3D images and the most powerful software in the industry, enhancing implant planning, oral surgery, endodontics, periodontics, restorative, general dentistry and much more. What is PreXion3D Cone CT imaging used for? a virtual diagnosis, offer up a personalized treatment plan with the expected outcome all in one visit. The PreXion3D scanner offers enhanced accuracy, visibility and predictability. The results are a reduction in procedure, surgery and anesthesia time, which ultimately translates into a quicker and more comfortable recovery. A PreXion3D Cone Beam CT scan is significantly less than a medical CT scan. treatment plans can be done in one visit. older traditional dental x-ray machines. show different angles and planes, allowing us to view any part of your anatomy from any direction or angle. This investment in high quality diagnostic imaging reflects our commitment to providing the best possible care for you and your family! Call us today at (703) 565-2503 for an appointment.